If you live in SouthWest Michigan and are part of a growing number of Michiganders that realize that Bernie Sanders is the Man with the Plan who can bring this country back to it's roots as a land Of the People, For the People and By the People...then you're in the right place! Bernie announced his candidacy today for the 2020 Presidential election! As you know, in 2015 when Bernie's name was not yet a household name, we started this little website and gave Bernie a name in SW MI. Now, 3 years later. We're back to finish it. Through this website, our Facebook page, and our email subscription system, we will provide volunteers with as many resources, ideas, and connections with others as we can. We're volunteers as well, and we're here to help- but we need everyone to pitch in. We all have different stretch-limits at different times in our lives; what's important is that we all do what we can on a regular basis. Talking to neighbors, Chalking the Block for Bernie, calling in to talk shows, writing letters-to-the-editor or to organizations in support of Bernie, calling the DNC and our reps in support of Bernie's (truly, our) propositions, taking part in gatherings and protests, even phonebanking- all of these things are important! 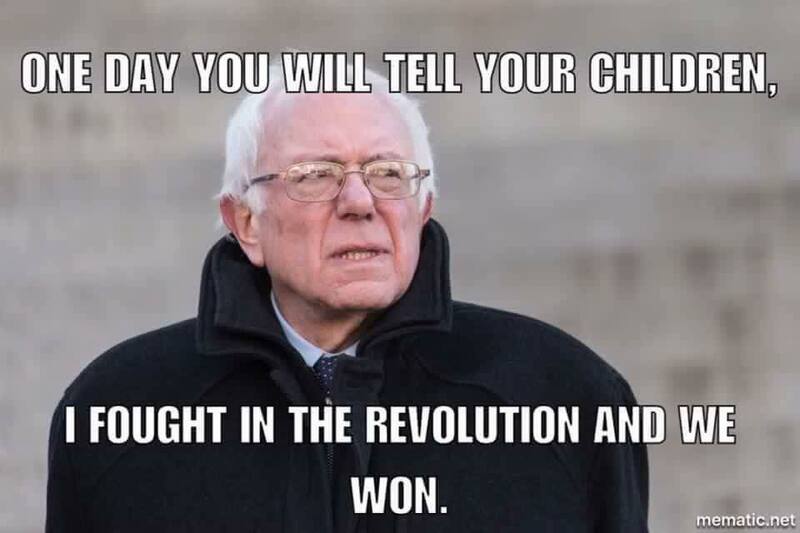 Everything we do for the Revolution makes a difference- for our country, for our planet, for our children. We're here to help- tips, resources, a source of information and ideas- we're in this together. Ultimately, it's up to each and every one of us, and we MUST think outside of the political box to succeed. SW MI for Bernie 2016 has now become SW MI for Progress. And SW MI for Progress has a new website! Visit www.SWMIforProgress.org today and tell your friends! and we'll be putting up another website VERY soon! In the meantime, visit us on Facebook HERE. and now the Michigan Democratic Party has the most progressive platform in state history! It is quite possibly even among the most progressive platforms in the country! 1. Direct, clear opposition to the TPP trade agreement. It is one of only a few that mention the TPP and has arguably the strongest anti-TPP and trade language in any state platform, period! 2. Strong language for campaign finance reform, getting money out of politics and ending Citizens United- including support for a constitutional amendment! 14. Paper-only, trackable, recountable paper ballots. No electronic voting machines allowed! I'm almost certain I'm not covering everything! We did this. We have been speaking out for these issues for a long time. It feels good to finally be heard. Now! Remain vigilant! All a platform really means is that we have set goals and we must work very, very hard to accomplish them! Sign up for a phonebank shift or set up your own phonebank party!!! You can even phonebank from home!! WE NEED YOUR HELP!! charles and kimberly will be in philly as delegates! I want to thank everyone who came to support us at the District Convention. We are going to win the contested National Convention. I know many are doubtful, but there is much reason to hope. California looms; 67.5% is needed there and WE CAN DO IT. We need to keep working. If you think you can't help from Michigan, think again. Phonebank from home if you must! On top of that, Hillary's poll numbers will continue to dip vs Trump in head-to-head preference polls leading up to July. Bernie's will remain 10+ points ahead. They are ALREADY offering all kinds of party platform concessions- trying to get Bernie to concede. They are scared. They know he could actually take the nomination. And so we're not giving up. We're bringing them the message: Bernie is the only candidate that can stop Trump, and the Party is risking the Presidency if you nominate Hillary Clinton. And they will listen, because keeping the White House is more important to them. The Party's progressive base, which is a majority, has them backed into a corner. The monetized party apparatus vs the actual voters....there has been a huge disconnect between these in recent years. 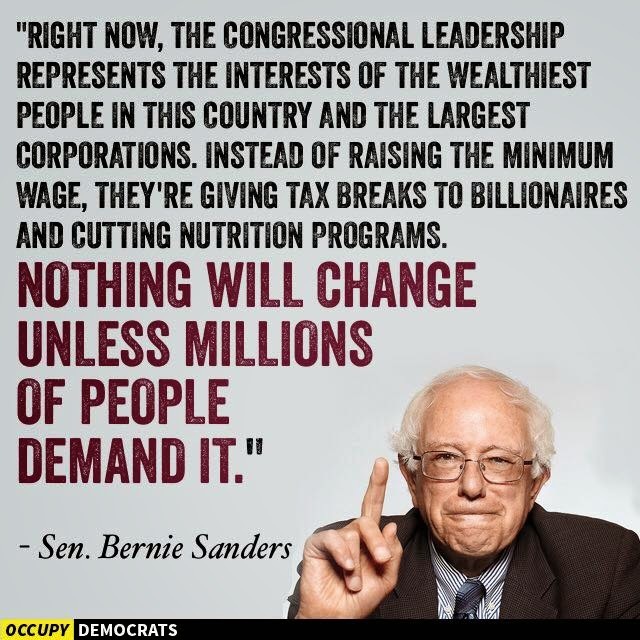 It's time to take the party back from the Reagan Democrats and end the Corporate Oligarchy! I will cast my vote for nothing less, and you have my word on that. Forget the total delegate count, it will change. The next states favor Bernie more heavily! He will shoot past Hillary and win the nomination. My prediction was that if he wins Michigan, he will win the nomination. But it won't be easy. It's not "in the bag". But the path is open. And we need YOU to help win this thing. 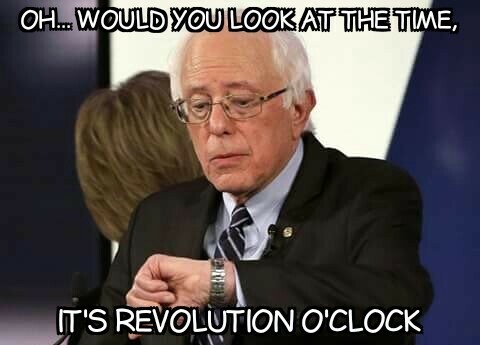 So help us finalize OUR Revolution! ﻿Bernie needs you!﻿ sign up now!! Since Bernie isn't running on billions of corporate dollars like the competition is, Bernie needs volunteers from around the state who are passionate about building a new America that is focused on working families, children, the elderly. 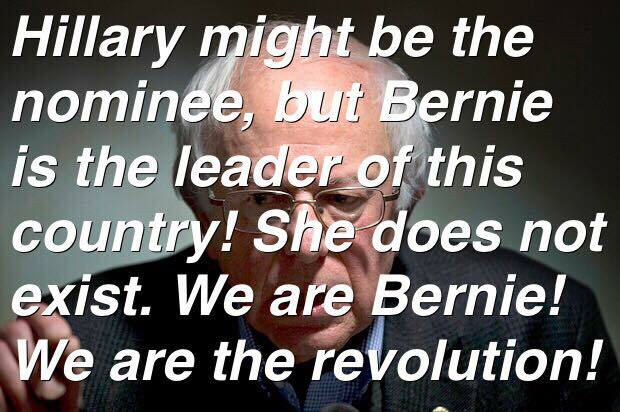 Bernie has a very real chance to win Washington back from the billionaires and Wall Street! This country can be led by The People again! To counteract all those negative ads that money will buy won't be hard- Bernie's record proves his integrity. He is a genuine man who sincerely cares about our country's future. All it takes is POSITIVE ACTION- and we need YOU to do your part! Your hard work and effort are what will win America back for the people, the habit of "buying the easy way out" must be broken! Sign up with your information below, and a site admin will contact you as soon as possible!﻿ Please include your city of residence to help us tailor our strategy to your area.﻿ Thank you! Remember the flint tragedy. we cannot afford politicians we cannot trust. ﻿﻿Knowing the corporate-owned media can't be trusted, there are two news sources we trust here at SW MI for Bernie 2016: The Young Turks and Redacted Tonight! * Tell all your Family and Friends about Bernie! Once you are added, you will be able to discuss projects, activities, and actions with the group, make or take suggestions, and take on responsibilities! Sign up for our email list using the form below! 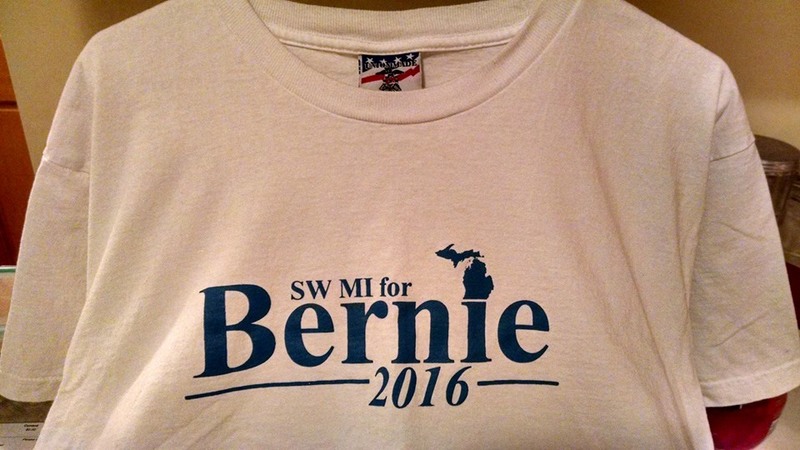 Want a sw mi for bernie 2016 t-shirt? Just fill out the form below! COD, please!